IT WOULD BE logical to think that 3 Doors Down knew they had a hit on their hands with the song "Kryptonite" well before that song was ever released as the lead single from the band's first CD, The Better Life. A version of the song, included on an early self-released CD, landed on the playlist of WCPR in Biloxi, Miss., and stayed in rotation for 25 weeks. The success of that song helped 3 Doors Down get a major label deal with Republic Records, part of the Universal Records group. But guitarist Chris Henderson says the band didn't come onto the national scene with heightened expectations because of the early success of "Kryptonite." "What happens is we're from the South, and the South is like its own little world down there, especially where we live, Mississippi," he says. "It's like living in a bubble. We thought while it did well here, what does that mean? This is one of the smallest markets in America. It did well here. That doesn't mean it's going to do well in New York City. Come on, those people there are bombarded with every different type of music you can think of." Obviously, "Kryptonite" has gone a long way--right to the top of the mainstream rock chart--and far enough to have propelled 3 Doors Down's debut CD on its way toward 5 million in sales. And with a two other singles, "Loser" and "Duck and Run," having hit the upper reaches of Billboard magazine's modern rock charts, it's clear that there's more to 3 Doors Down than "Kryptonite." The success of The Better Life is quite an achievement, given the humble beginnings of this band. 3 Doors Down were formed by singer/drummer Brad Arnold, bassist Todd Harrell, and guitarists Matt Roberts and Henderson about five years ago in the small Mississippi town of Escatawpa. (A drummer, Richard Liles, has since joined, enabling Arnold to move out front as singer.) The group built a following by playing around the Southeast, recording their indie CD to sell at gigs in 1997. But it was a decision to pursue a slot on a "homegrown" show dedicated to area talent on WCPR that eventually paid the biggest dividends for 3 Doors Down. Over the course of a year, the band made some 10 appearances on either the WCPR's "homegrown" show or the station's morning show before "Kryptonite" was added to the playlist and record labels tuned into the band. 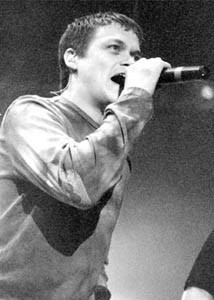 Judging from the material on The Better Life, 3 Doors Down's songs were far better than the band thought when producer Paul Ebersold got involved in the project. With a guitar rock sound that sits comfortably alongside mainstream acts like Matchbox Twenty and Third Eye Blind, songs like "Kryptonite" (known for its line "If I go crazy, then will you still call me Superman"), "Not Enough," "Better Life," and "Loser" are all built around meaty guitar riffs and melodic vocals. Though 3 Doors Down are hardly innovative in style, one thing that separates them from bands like Matchbox Twenty and Third Eye Blind is that their songs are built around heavier guitars, which add an appealing dose of crunch to the band's sound. THE APPROACH 3 Doors Down take to music is as straightforward as it seems. "I think that the key to rock and roll in America today--this is just my opinion--is you want to keep it simple, and you want a groove in there; you want harmony and you want melody," Henderson says. "You just want simple songs that people can relate to, songs about life, everyday life, because what everybody is faced with every day is everyday life." With sales of The Better Life climbing past quadruple platinum, it's possible that 3 Doors Down could be the Matchbox Twenty of 2001, a band that seemingly comes out of nowhere and sees its debut CD become a monster hit. Henderson isn't fazed by the idea of the band selling upwards of 10 million albums. "That's what we want, that's what we've always wanted. That's what anybody in a band wants," he says. "I look at it like this: There are so many people in bands who want to do this, and there are so many bands that don't make it, that aren't successful. One or two are, so when you're successful, man, you've got to take it and run with it. There are a lot of other bands that want to live the life through you. Basically, we owe it to ourselves and we owe it to everybody else and to all of our fans to do the best we can and take everything that comes to us. So as many records as they want to buy, man, . . . let it get as big as it possibly can get and we'll handle it." By the same token, Henderson says he and his bandmates aren't going to let the success of The Better Life become a distraction when it comes time to record the next CD. "We're going to approach our next record just like we approached our first one," he says. "We're going to write some songs, we're going to go in the studio, and we're going to see what happens. That's really all you can do, and if you try too hard, you know what, you're going to make a mistake and step on your feet." 3 Doors Down headline Fox Fest 2001 on Saturday, July 14. Lifehouse, Tantric, and Seven Channels also perform at the Crusher's Stadium in Rohnert Park. Gates open at 1 p.m. Music runs through the early evening. Tickets are $30. 707/543-0100. From the July 12-18, 2001 issue of the Northern California Bohemian.